was an orphan and worked as an apprentice in Ike Smiths welding shop in Greystone. Running was his sport and Alf would enter as many Invitation Events, he could afford. 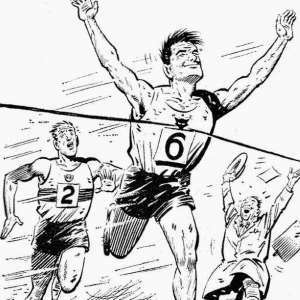 He was a specialised middle distance runner in the mile, 5000 and 10,000 metres, a dedicated runner, training hard, noshing through his favourite diet of fish and chips served in the local newspaper. He would travel the breath of the country to run, even abroad, often hitching lifts and sometimes working his fare to run. But when Alf was at the athletic meeting he was ready for any opposition, raring to race, running his heart-out to reach the tape and win. Alf Tupper was a great comic character, appearing first in the Wizard comic way back in 1949, also in the Rover comic of the 50's, then in the Victor comic from 1962. He appeared in every Victor Annual from 1964 to 1994. He was a tough little character, ready for a fight. Worked very hard as a welder, first as an apprentice until he owned his own welding shop under a railway viaduct at Greystone. Always seemed to be the underdog, that's why I liked Alf, but always came up smiling, gaining respect from the public and fellow runners. His famous quote was, "I ran 'em all".